Abu Danladi ran behind Ibson’s well-played through ball and crossed it to a streaking Ibarra for the equalizer. 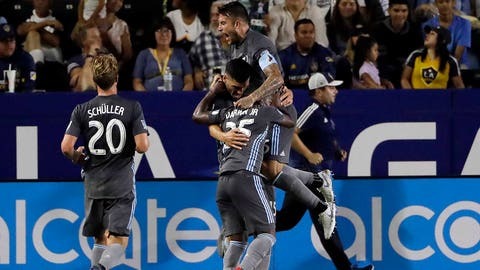 Romain Alessandrini put the Galaxy ahead in the seventh minute, taking Ibrahimovic’s lay-off and pushing it around a defender before hammering it home from 25 yards out. Alessandrini left the game in the 24th minute with a right calf injury. Michael Boxall tied it at 1 for Minnesota with his first MLS goal in the 64th minute, heading along Darwin Quintero’s deep cross into the far corner.